This mural “Lewis & Clark at Three Forks” hangs in the lobby of the Montana House of Representatives. 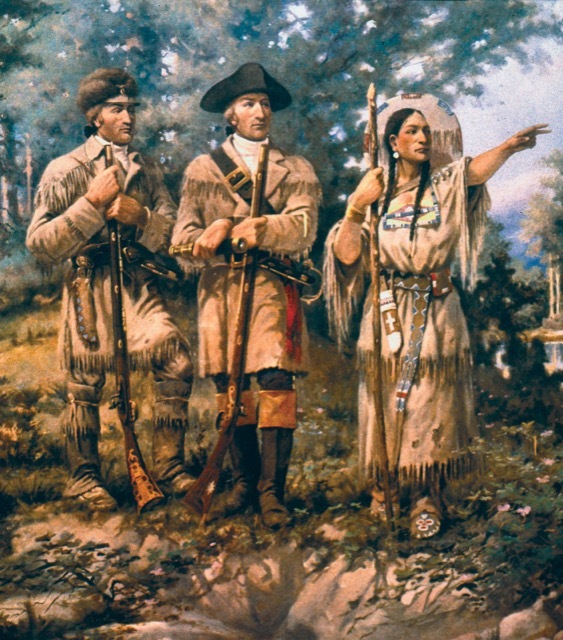 Shown with the explorers is Sacagawea of the Shoshone tribe, who accompanied them for part of the journey. Image courtesy Samuel Paxson. 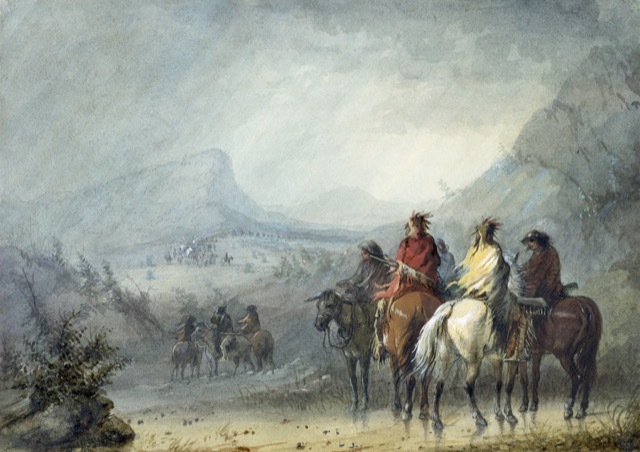 Meriwether Lewis and William Clark, first to record their crossing of the Continental Divide, set out on their remarkable Corps of Discovery Expedition on May 14, 1804, their trek to the west lasting 28 months. As they exited the Bitterroots heading east upon their return, they split up to explore more of the Louisiana Territory than they could have in tandem. Clark and his group made their way down the Yellowstone River, while Lewis took a shortcut to the Great Falls. 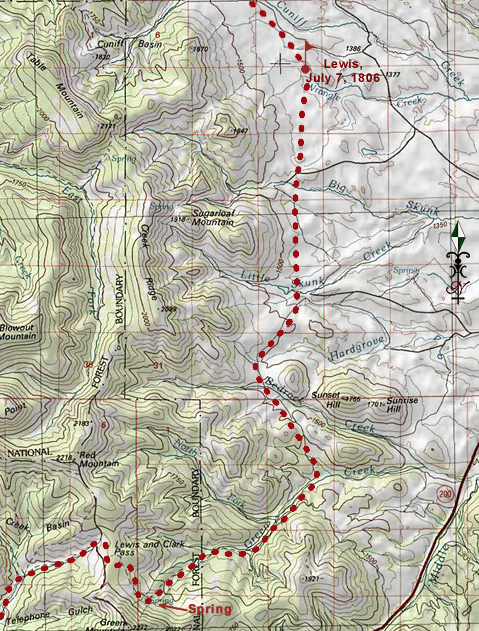 The flag on this map marks the spot where Lewis crossed over the Continental Divide on July 7, 1806. As he crosses the Great Continental Divide by the gap that is now known as Lewis and Clark Pass in Montana, Lewis notes in his journal on July 7, 1806, “Passing the dividing ridge between the waters of the Columbia and Missouri rivers.” That was 211 years ago to the day as I am writing this post. The map that Lewis and Clark drew after their Expedition. Since we’re going transcontinental for our summer markets—from Atlanta mid-month to Las Vegas at the end of the month—I thought we’d celebrate the magnificence of Mother Earth and the Great Continental Divide, which often declares itself as nothing more than a bout of turbulence if you fly into Vegas from the east. It was quite a different story when the only way across it was on horseback or by wagon train! 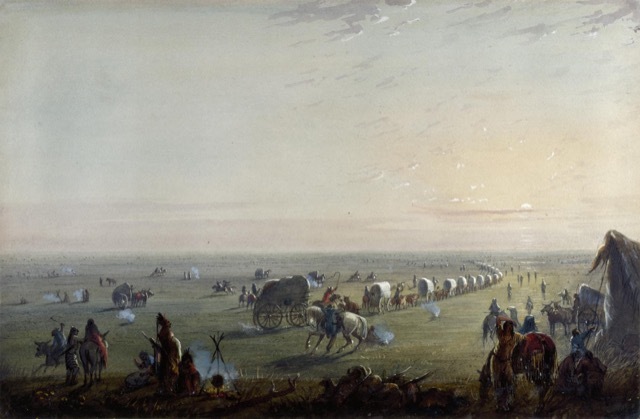 “Breaking up Camp at Sunrise,” by Alfred Jacob Miller. At this point, the family had been on the trail for exactly four months to the day, their departure from Independence, Missouri, taking place on July 3rd. More from Ethan’s journal in a bit. Let’s take a moment to celebrate some of Currey & Company’s most popular elemental offerings, products made with materials culled from the earth and turned into appealing designs. The profile of the Highbank chandelier is lantern-like though its roots were born in classicism. Bringing the shape into modern times is the nod to the Arts and Crafts movement. 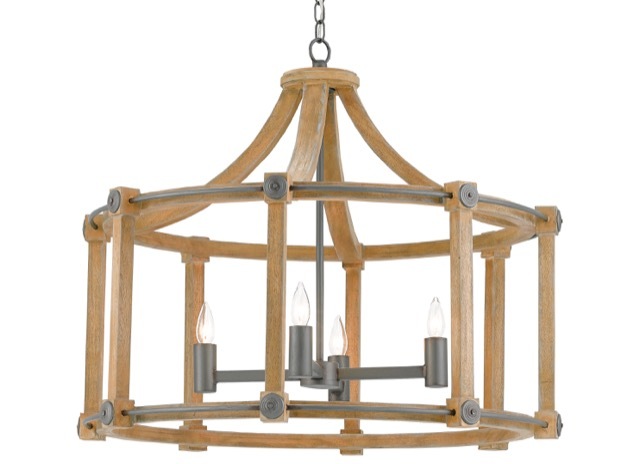 Wood and metal, two of nature’s greatest gifts, bring this chandelier a continental freshness. 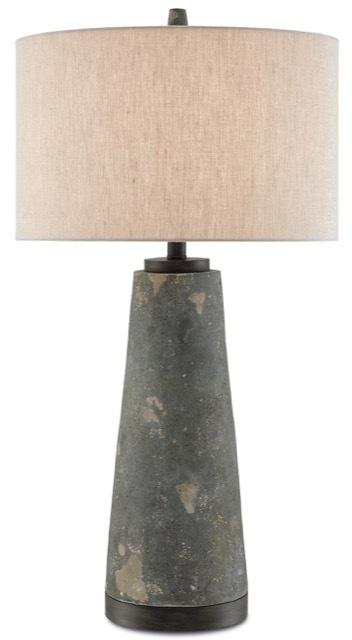 The Celadon table lamp may look like aged concrete but it’s made of distressed terracotta, a name long-ago given the material that means “baked earth.” Clay dug from the ground never looked so appealingly edgy. The Tulee accent table, made of cast aluminum in an antique copper finish, wears its stripes with aplomb. Turning metal into a fine specimen of design is nothing short of alchemy. 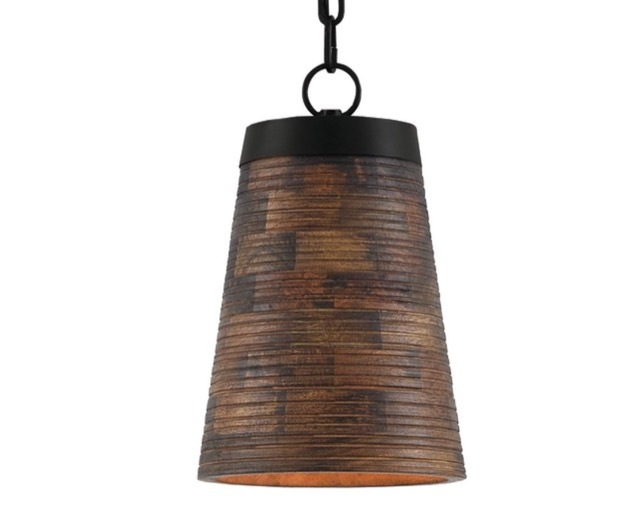 The Porchside pendant is made of reclaimed wood and wrought iron, the wood laminated in a patchwork style and turned to create the circular groove pattern. 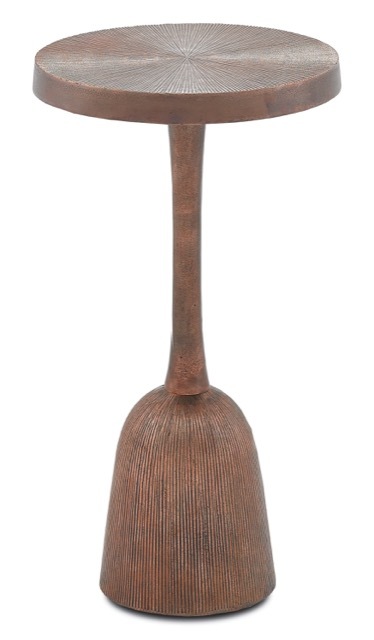 It is hand-finished with a dark stain on the wood and a black finish on the metal. Reclaiming wood is a sustainable practice we are quite proud to undertake. 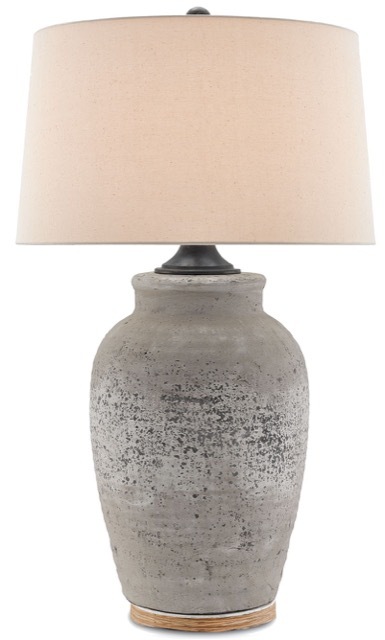 The aesthetics of the Quest table lamp may give the impression that it has lived a long life but the concrete base finished in a rustic gray is a fresh example of industrial chic. Aggregate (rock, sand or gravel) and water are elemental offerings the earth supplies; add a binding agent like cement and you have a remarkable lamp! 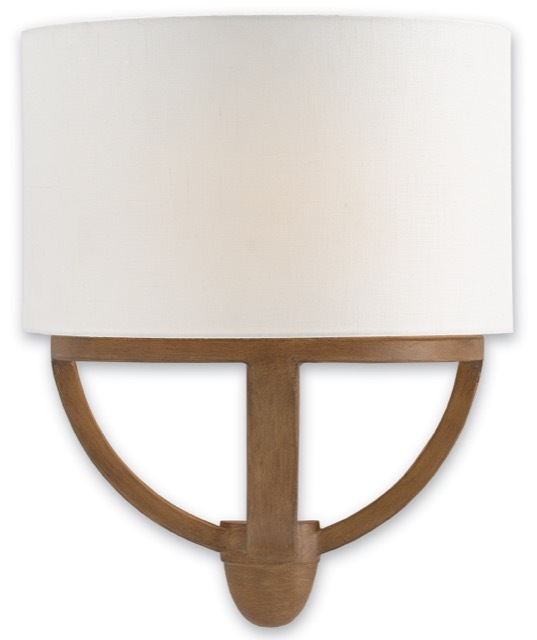 The half-round linen shade of the Axel One wall sconce juxtaposes the articulated wood frame to intermingle warmth and crispness. The art of turning a knotty tree trunk into such a smooth work of art is one of our strengths at Currey & Company. The aesthetic is truly continental! And on with Ethan Fall’s story we go! The man’s history makes him a fascinating character to have been among the hoards making their way west by wagon train. He was born on a farm in Scotland but his parents died when he was a young man. When his father died—he was the last to go—Ethan went to live with his uncle, who owned a printing works in Edinburgh. Under his guidance, Ethan became a talented typesetter. When it was evident the young man had great talent with unique and expensive papers, his uncle sent him to apprentice with a publishing house in Oxford, England, run by William Samuels. He fell in love, married and had two children. Then his wife Alice died, and he and his two daughters, at the ages of 10 and 12, had a difficult time living with so many reminders of her. At his employer’s suggestion, they headed to America where Ethan intended to buy a print shop he was assured was for sale in Charleston, South Carolina. When they arrived after a dangerous voyage in a tri-master sailing ship, a dramatic occurrence took place that drove them out of Charleston, then farther and farther west. While setting type, Ethan admitted there were many times he had had to remind himself not to get lost in reading the works of the great minds he was putting into print. His exposure to them at work and his careful reading after hours accumulated to make the former farmer’s son quite an educated man. “Storm: Waiting for the Caravan,” by Alfred Jacob Miller. “I am no poet. I will never be a poet. Setting type, I have read many books written by Oxford poets. Many times William let me bring the book proofs home and read them to Alice. Both she and I marveled at the ability of poets to create long lines of words that felt as if they should be sung even more than read. “Today, when I was watching Rose, I wished I was a poet. I wished I could write down what she looked like bundled up in a dark coat, her head covered by a dark scarf, her hands shielded from the cold by dark mittens as she moved among the four oxen, because even then she was lovely and strong. 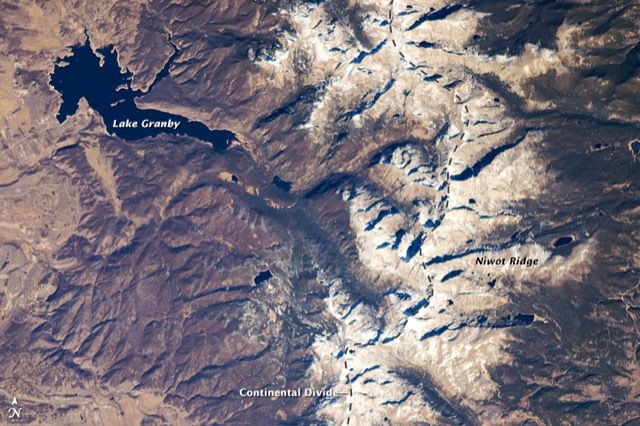 The Continental Divide in the Front Range of the Rocky Mountains of north central Colorado, taken from the International Space Station on October 28, 2008. To all of you attending the summer markets, may you safely pass over the Continental Divide if you are heading west. Here is a reminder where you will find us in Atlanta and Las Vegas. Happy trails, everyone! Las Vegas Market will get the party started on July 30 and last through August 3. You can find us in Building C, Suite 398, so be sure to stop by if you’re in town. This entry was posted in Currey & Company, History, Market, Products and tagged Chandeliers, Gray, Natural, occasional tables, Rustic, Table Lamp, Wall Sconce, Wood on July 11, 2017 by Currey & Company.